And once again, I decided to read a book that eventually became a movie. I know that loads of people say that no film will be as good as the literary source and I agree but there is no other way of finding out this than reading the book and watching the motion picture - however the order - right? The first book is quite hooking at the beginning, when Thomas get into the maze, the unexpected arrival of Teresa the very next day and all the events that will follow. What I do appreciate of the book is the way James Dashner narrates the world inside the maze that is nothing but the basic organization of social group: the providers, the workers, the authorities, even the medics. Whilst the providers are limited to agricultural and livestock, the hunters will be substituted by the runners who are in charge of a critical task: to map the ever changing labyrinth. Therefore, the survival common goal of any social group which is mitigated by the external supplies given by ‘The Creators’ is replaced by another implicitly agreed purpose: to get out of the maze. Another great merit of Dashner's work is the detailed exploration of Thomas’ mind during his adaptation process to the community: the fears triggered by the partial loss of memory, the bullying and the unknown, as well as his imminently raising as the leader of the group with its small victories and downfalls. And, another nice touch of the plot for me was to be able to remember one of the most popular phrases of a great teacher in my master of business: the only constant is ‘The Change’. The second third of the book gets a slower rhythm and sometimes I felt like nothing is happening but you will later discover that all those little details that may seem irrelevant will be key on the last part. And, yes, I must confess that the last dozen of chapters kept me turning the pages non-stop until my delicious chai latte got cold. An advise for all our followers and, in particular those looking for adventure books: The Maze Runner will be one of those fascinating readings that will make you want to buy get the next three parts. I would also recommend to shake off any memories you may have of the movies – if you saw them – and get into the story with fresh eyes and mind. If you want to revive those first days in school, when you joined the Boy Scouts, your first fight, the day that you discovered those skills that made you decide and build your future, etc. 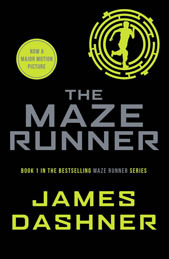 The Maze Runner will be, without doubt, the right book for you. Thanks to Małgo for the nice present!